This post is about more than just foodporn! 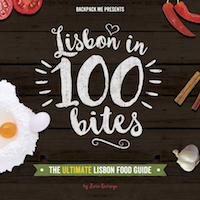 We have invited 80 travel and food bloggers from across the globe, to share a quick intro of a representative dish from their country of origin or a place they have visited. More than drooling looking at the appetizing pictures, we are attempting to awaken your curiosity for far-away places, cultures and flavors that you might, or might not, be familiar with. There is no doubt that food plays a key role in the cultural identity of countries across the world and some traditional dishes from specific regions have even become internationally recognizable icons. Pasta screams Italy out loud, same goes for sushi in Japan or curry in India. But what about everywhere else? Allow us to welcome you on a voyage around the world, through 80 dishes. 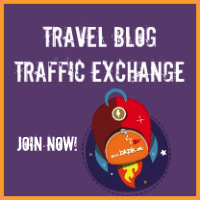 To learn more about the food, countries represented and the contributing bloggers, make sure you click the blog link included at the end of each individual post. 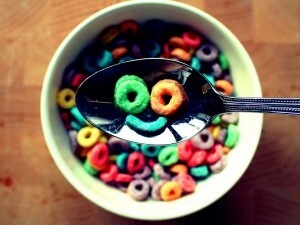 Bon appetit & have a good trip! 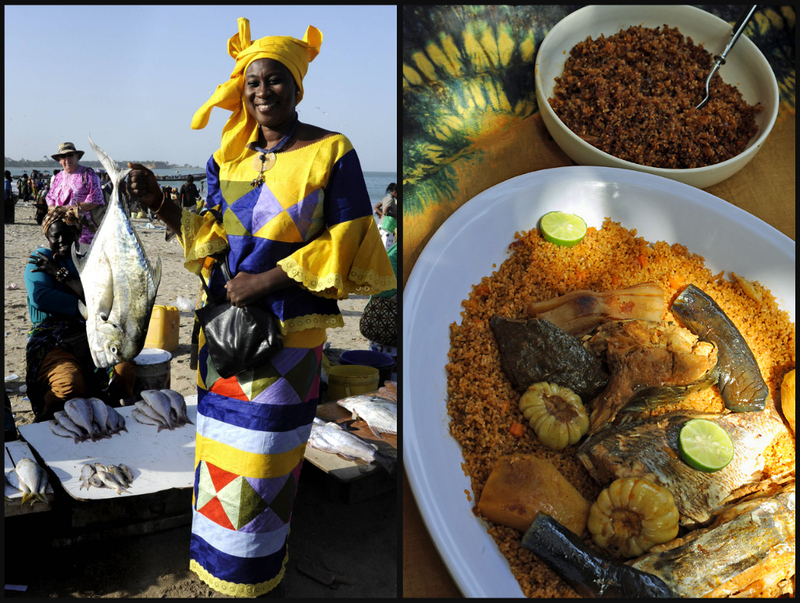 I’ve been lucky enough to visit The Gambia many times and love the local cuisine. The staple food is rice, served with a spicy sauce such as peanut based domada, chicken yassa or fish benechin. These three dishes are all common on restaurant menus, as well as being popular in Gambian homes, the latter being my favourite. Few homes have electricity let alone a fridge so every day the women head to the local market to buy fresh ingredients. What they buy will depend on what is available and looking good that day. If fish is on the menu the ladies at the market will de-scale and gut it while you buy the other ingredients. For benechin that will include tomatoes, carrots, spring onions, sweet potatoes, onions, aubergine, cassava, bitter tomatoes and butternut squash. Most cooking in The Gambia takes place outside with a single cooking pot over a fire. Benechin literally means one pot. Chillies and garlic are mashed up in a bowl made out of a gourd with a smaller gourd used as the pestle. They are fried in some oil with a dash of salt and Dijon mustard. Some of the vegetables are cut up while others are left whole. These are cooked for well over 2 hours with the fish added part way through. The smell while it is cooking is so good, it will have your tummy rumbling long before it is ready! When done the fish and the whole vegetables will be scooped out and put to one side. The rice will be placed into one large bowl and the sauce poured over it. Lastly the fish and vegetables will be placed on top. Everyone will gather around the bowl, eating with their right hand. Although as an European I am usually given a spoon, I still always manage to make a terrible mess! 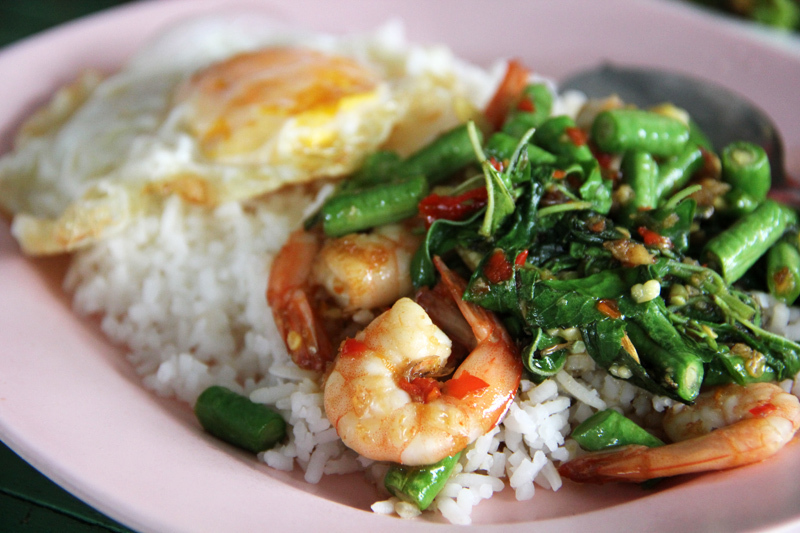 One of the most common and always available Thai dishes anywhere you go in Thailand is pad kra pao. You first choose a meat: pork, chicken, shrimp or squid, are all typical options. The meat is stir fried with garlic and chilies, seasoned with dark soy sauce, and finished with an all important handful of Thai holy basil (known as “kra pao”), which gives the dish its signature peppery flavor. The dish is scooped over a plate of hot rice and served with an optional, yet I’d highly recommend it, fried egg on the side. When it comes to Poland and its traditional Polish cuisine, pierogi come as first. Although they are high in calories, topped with oil and fried onion, yet very stody, nobody cares when it comes to eating them. Reason? They are just heaven in your mouth, so creamy and thick and trust me, once you start digging into them, you can’t stop! • Meat (beef) – mostly preferred by male foodies. • Sauerkraut and mushrooms – mostly served at Polish weddings, Christmas and Easter. • Seasonal fruits (strawberries and blueberries taste the best) – great idea for a summer dinner. • Cottage cheese and boiled potatoes – served on Sundays at family dinner. Pierogi are extremely delicious, but difficult to make. They are boiled first and then baked or fried in order to get crispy texture. They can be served with oil, onions and tiny pieces of bacon or sour cream and sugar (fruit ones). So if you ever make it to Poland, don’t forget to have a plate of two. Rice is a vital part of any Indonesian meal, and that includes breakfast. Yes, forget the toast and marmalade, we prefer having a good portion of rice. One of my favourite breakfast dish is Soto. This is a popular breakfast amongst Indonesians, especially in Java. 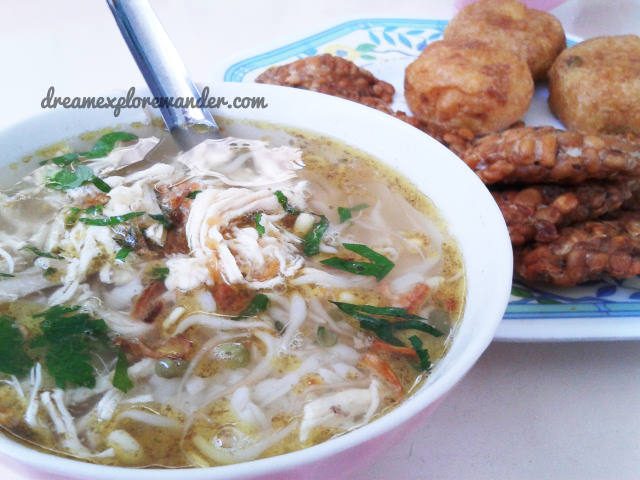 Chicken Soto is one that I eat some mornings to boost up my energy. It is pretty simple, a bowl filled with rice, bean sprouts, shredded chicken, fried onions poured with a flavourful chicken broth. It is best eaten with some fried tempe or balls of mashed potatoes. With a splash of sambal and a squirt of fresh lime, Soto is both refreshing and the perfect way to start your day. There are different types of Soto across Java. 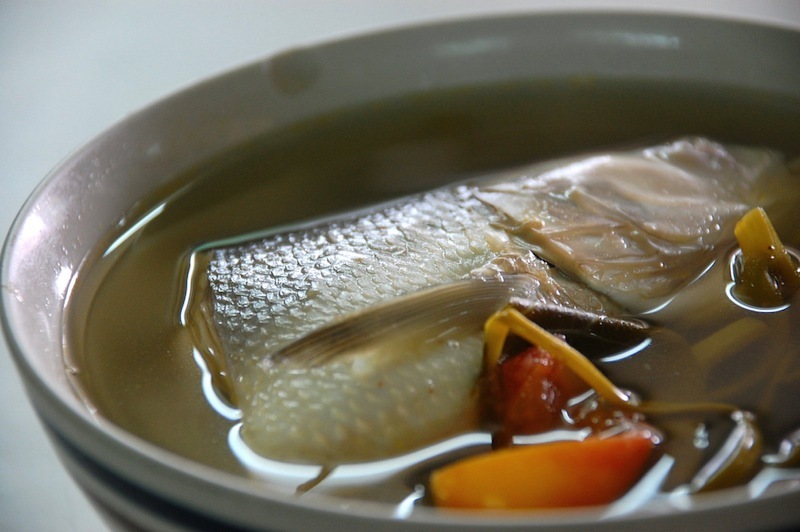 There are some with different style of broth, such as adding coconut milk into the soup. There are also some with beef instead of chicken. Whichever way you enjoy your Soto, it’s one breakfast meal you simply cannot miss in Indonesia. As its name suggests, Colombia’s Eje Cafetero is the country’s coffee-producing region, so it might surprise you that the most popular food here is trucha, or trout. Of course, the reason for this is not that Colombians believe trout goes well with café – it’s because the Coffee Triangle happens to be home to nearly as many trout farms as coffee ones. 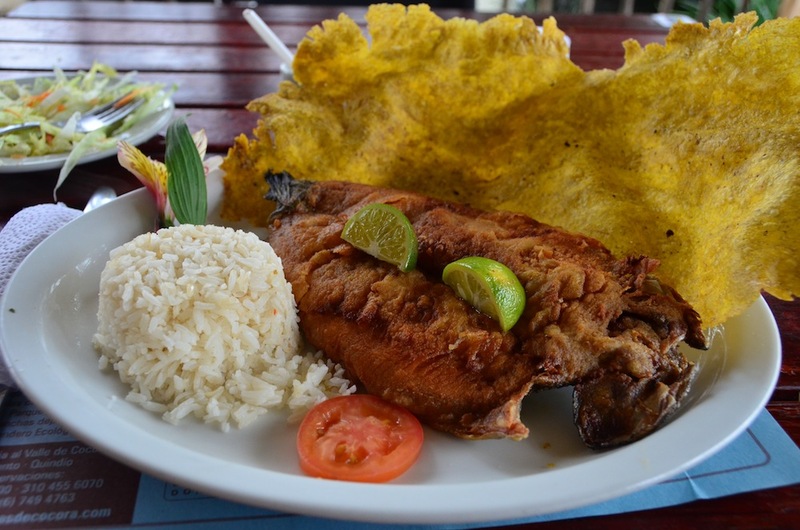 My personal favorite preparation of this iconic dish is simple, delicious trucha frita – fried trout. Served with rich coconut rice, a crispy sheet of fried plátano and a light salad, it’s the perfect end to a day hiking through the Valle del Cocora or visiting coffee fincas. Milkfish is called “bangus” in the Philippines, where it is the national fish. Just like Tilapia, Bangus is one of most heavily consumed fish in the Philippines. Sinigang is a popular recipe in the archipelago and it is characterized by its sour and savory flavor most often associated with tamarind or what we locally call sampalok. Seasoning powder or bouillon cubes based on tamarind is also used in place of natural fruits. Bangus is stewed with tamarinds, tomatoes (kamatis), garlic (bawang) and local onions (sibuyas). Once the fish is cooked, vegetables like Okra, taro corms (gabi), daikon (labanos), water spicach (kangkong), yardlong beans (sitaw) and eggplant (talong) is mixed with the broth. To add spice to the dish, a green finger pepper (siling haba) is added to enhance the taste. Sinigang is a Tagalog dish but it is also famous in Visayas and Mindanao although some of their recipes are using different souring agents instead of tamarind. One of the most common foods that you will find on a Tanzanian dinner plate is a mound of Ugali. And I couldn’t possibly travel all the way to Africa without indulging in this bit of traditional food culture. Ugali is a stiff porridge made from maize flour (cornmeal) and has many similarities to the more familiar Italian polenta. It is a staple in kitchens across Tanzania and the backbone of almost every meal. Ugali is eaten by taking small sections of the firm cornmeal, rolling it into a ball, squishing it between your fingers and then using it to scoop up the meat, fish, beans or vegetable dishes served with it. 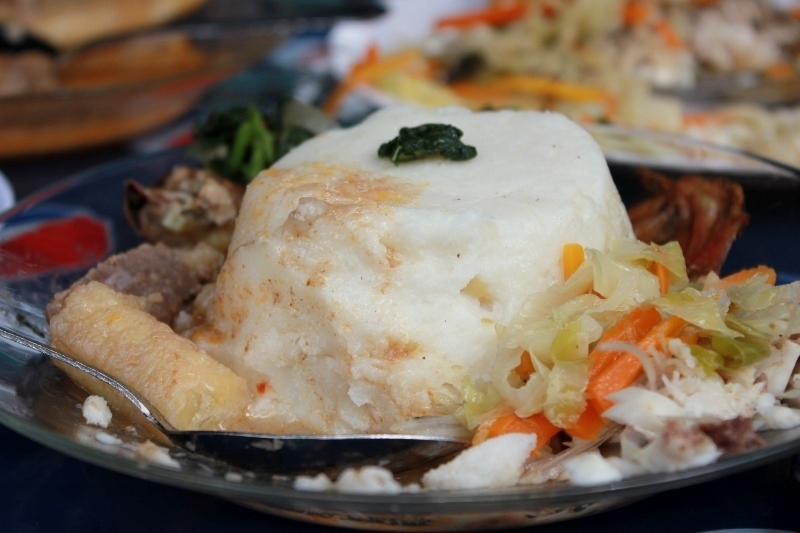 At Arusha City Park restaurant, our Ugali was served in a symmetrical pile, centered on a clear glass plate. We had ordered a variety of meat, fish and vegetarian dishes to accompany it; Ugali Samaki, Ugali ng’ombe Choma, Ugali Kuku Choma kienyeji and Ndizi Machalari. Then, as instructed, we used our fingers as handy eating utensils. The Ugali was mostly tasteless, but luckily it took on the flavor of all the other savory dishes that it touched. These are Hojaldras, a very traditional Panamanian food that they eat for breakfast. 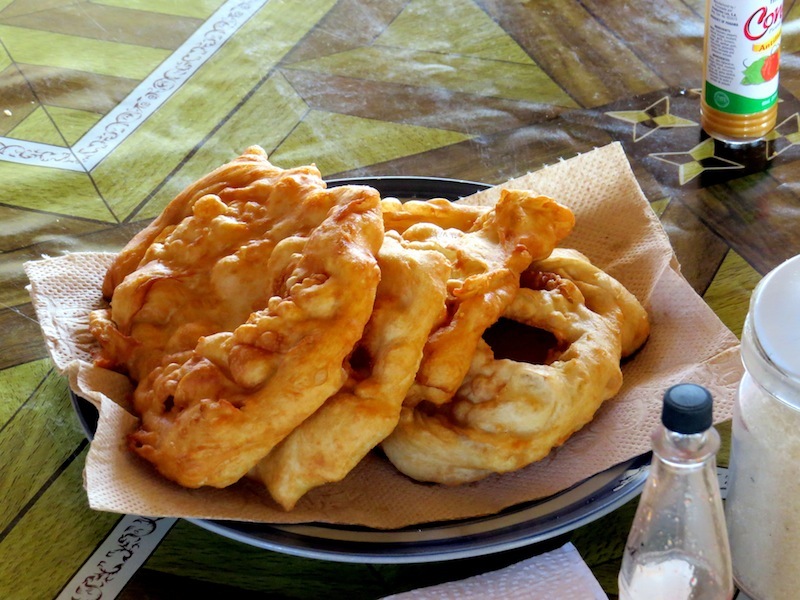 It is deep fried bread (like a doughnut) that you can find at any fonda – which is like a roadside stall that they usually cook with a wooden fire. The ingredients are pretty much milk and white flour but it contains no yeast so they fry it until it is crunchy. It’s very normal for Panamanians to eat this for breakfast many days of the week with coffee and eggs on the side. They put a little sugar on it to make it sweet or sometimes they like to dip this bread into a meat dish to soak up the sauce for a savory breakfast. Although it’s not as common for the current generations to eat hojaldras everyday, it is for the older generations. Since it is not the healthiest thing to eat for breakfast or in general too often, hojaldras aren’t normally served as a breakfast staple anymore. You will be able to find them in any fonda, fried fresh as most vendors cook them on the spot. Iraq offers the same obvious sort of food treats that the rest of the Middle East does – kebabs, pitta bread, burgers etc. But for me, the best and most authentic option when backpacking in Iraq is to go to a very local restaurant and order what can only be described as a Kurdish Feast! Rather than one huge meal, this is a lot of small dishes which make up a feast. The locals eat this stuff as often as they can – it comes in big helpings, is cheap and you won’t go hungry. I have sampled its delights in Erbil and Duhok. To go with it, you’ll need some drinks and while the normal local choice is simply water, Ayran is definitely worth trying – a yoghurt drink. For after the meal, wash it all down with a cup of Iraqi tea. If there’s one thing you can’t leave Taiwan without trying, it’s beef noodles. It’s Taiwan’s national dish, and there is even an annual beef noodle competition where chefs compete to create the most scrumptious variation. A pile of noodles, chunks of fatty beef, and a simple beef broth are the foundations of this sensational dish. Each restaurant has its own unique flavor; experiment until you find your favorite. With a beef noodle shop on nearly every corner, it shouldn’t be hard to do! You’ll also find an assortment of noodles in the soup depending upon the venue. Our favorite ones come from a solid noodle block from which the chef chops off slivers straight into a steaming bowl of broth, better known as knife shaved noodles. 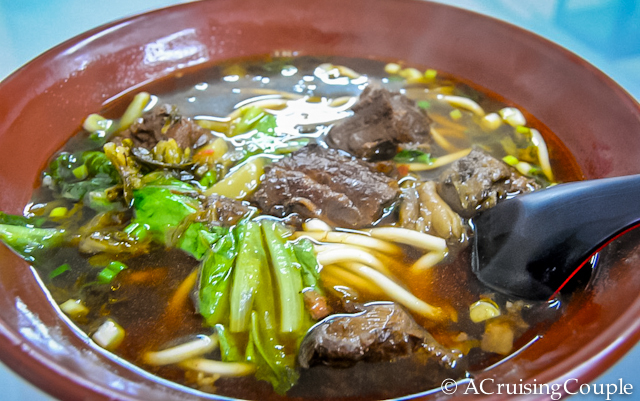 Beef noodles are particularly comforting during Taiwan’s surprisingly cold winters and frequent rainy days. Prices vary depending upon the restaurant. At some street-side stalls you can expect to pay only two dollars for a large bowl. Other restaurants with higher quality braised beef will charge around $6-7. Taiwanese are very proud of this dish—don’t be surprised if every restaurant you enter assumes beef noodles are the reason why you came! Rwandan food is neither spicy nor hot. Plain can be a word to describe it. But it can be extremely tasteful. I had the chance to try the local food just like the locals. Cooked with their natural ingredients and cooked in a simple and natural way. Not on the stove; simple with fire woods on a big pot. For dinner the owner of the house cooked a combination of isombe (cassava leaves with Eggplant and spinach), beans and French fries. At first, when I saw how the isombe was looking, I said to myself that I probably won’t eat it. But the combination, made the dish incredible tasty. Since the Rwanda food lacks of spices in general, neither my food had any. As far as I remember it did not have cooking oil either. It was a simple meal but was on of the best I had in whole Africa. If you ever travel to Rwanda try to eat at local rather than a fancy restaurant! Ps: definitely try the banana bread! Pumpkin is not very often used in Armenian cuisine but there is this one very unique dish you can’t make without one. Ghapama, this is what pumpkins in Armenia grow for. 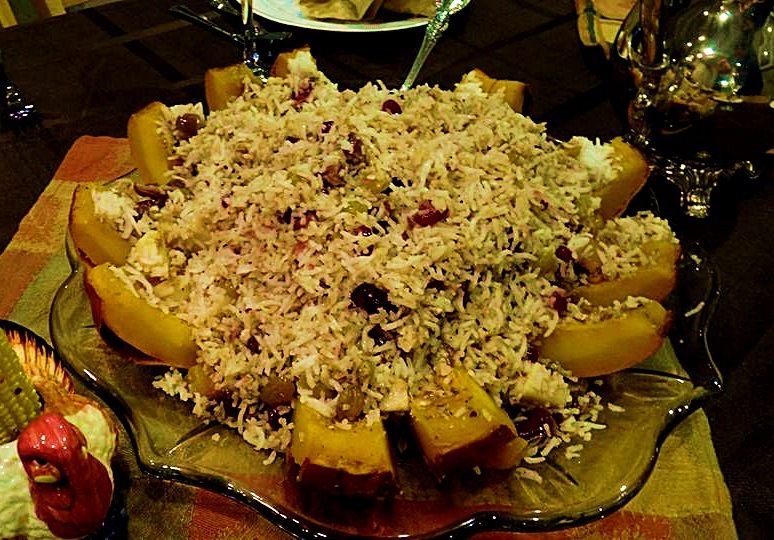 Ghapama is one of the most original and festive Eastern Armenian dishes. It literally means ”cooked in a covered pot”. What does hide by this mysterious name? Something as tasty as baked pumpkin stuffed with a fruity rice stew. You can also find prunes, dried apricots, honey, raisins, chopped almonds and walnuts and apples in it. Salt and cinnamon powder are added for taste. The whole pumpkin is baked and sliced on the table while served. Ghapama not only tastes great, it also looks so appealing! Traditionally, Armenians prepare this dish in winter, especially in the holiday season, between the New Year’s Eve and Armenian Christmas celebrated on January 6th. There is a very famous traditional Armenian song about this yummy Armenian dish popularized by Harout Pamboukijan. The chorus, hey jan ghapama, hamov-hotov ghapama means dear ghapama, tasty-aromatic ghapama. The lyrics tell us a story of one family that baked a ghapama. 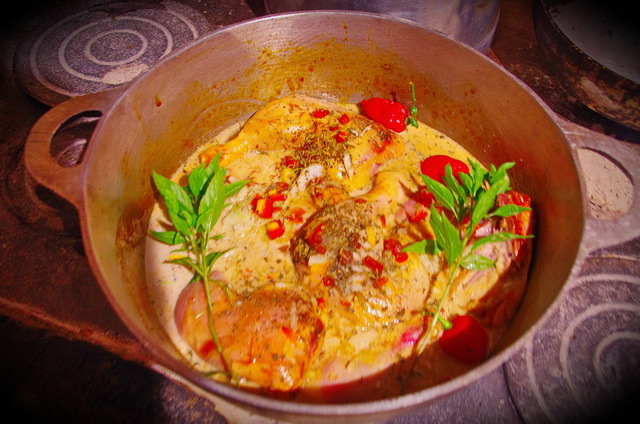 The dish was so aromatic that the whole village came over their home to get a bite. Guess what, nothing was left for these who prepared it! It’s probably the most popular Armenian food song, very often played during weddings. Take a listen! Costa Rica is not known for its food. It’s a beans and rice country with Gallo Pinto – an onion, garlic and bell pepper flavoured beans and rice dish coming in as the most featured item on a menu in the nation. That’s not to say that it can’t be delicious; it is but black beans served three times a day can get repetitive. One evening on a recent visit to the country a few of us had a chance to take a cooking class with a local family. They lived very simply but ate very well. We were taught how to make Caramelized Chicken in Coconut Sauce. All the ingredients were local, most right from their property. They are also available to most everybody in the country. It’s easy to make – unique by Canadian standards and absolutely delicious. Here’s a quick look at how to make it. It’s for those of you who don’t mind experimenting without specific measurements. Caramelize some brown sugar and add water, just enough so that when you add the chicken it gets deeply browned. Stir in several cups of fresh coconut milk (from the coconuts on your property) and simmer for 45 minutes along with a bunch of fresh basil and diced hot peppers to taste. Serve with tortillas, black beans and salad. Both Hamburg and Berlin claim to be the home to currywurst but if you ask me, Hamburg does it better! The sausage you get with currywurst (the “wurst”) can be either mit darm or ohne (that’s with skin or without). You usually order it mit pommes (with fries) and it’ll always come with a healthy splattering of curry-ketchup. I can’t tell you the Bulgarian name for this dish seeing as I was handed an English menu, however, what I can tell you is that this meal is one that I will remember for a long time. While visiting Sofia, the Bulgarian capital, my girlfriend and I ended up eating at a little restaurant called “Lubimoto”. Since it was almost winter, we decided to order a hearty dish off the menu and the first thing that caught our attention was the pork loin. Once the dish arrived, it was better than either of us could have anticipated. Our plate was more like a platter, and the pork loin was accompanied with boiled potatoes, mushrooms and pickles, all covered in gravy and melted cheese. Not to mention that the meat was tender and flavourful – I think we hardly spoke during that meal because we both enjoyed it so much. We went back there several times after that! 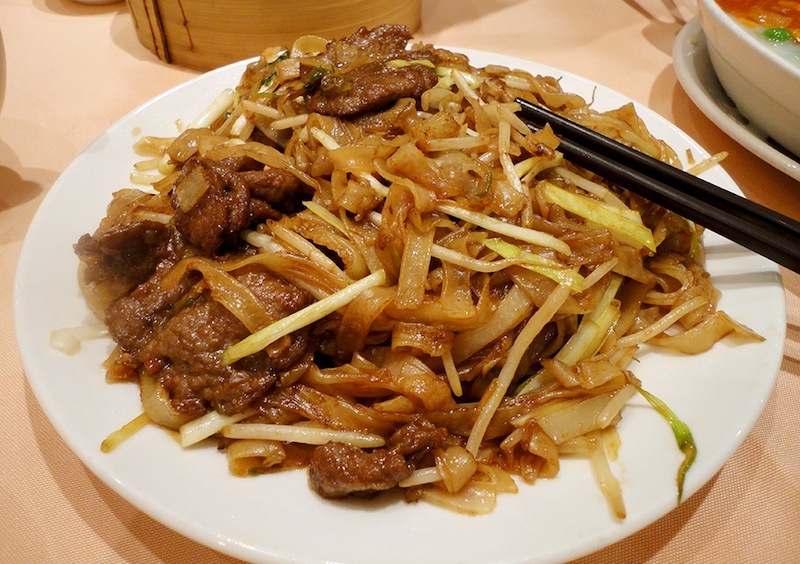 Known as “beef chow fun” or “beef ho fun” in English, gon chow ngau ho is a staple of Cantonese cuisine. You’ll find this dish everywhere in Hong Kong, from fancy yum cha restaurants to shabby cha chaan teng cafes. However, despite the fact that it’s sold everywhere, it is quite a difficult dish to prepare correctly. Made from ho fun (wide rice noodles), beef, bean sprouts, onions, these ingredients are stir fried along with soy sauce and oil. To make a better gon chow ngau ho, the stir-fry must be cooked over a high flame, which means the stirring needs to be done very quickly to avoid overcooking or burning. Besides needing to be stirred quickly, it also needs to be stirred very gently or else the noodles will break apart. Another important aspect of gon chow ngau ho is how wet or dry the dish is. Often chefs will add too much or too little oil, which ends up ruining the flavors and textures in the dish. All of these factors are what make the dish very difficult to prepare. In Hong Kong, you can usually tell the quality of an establishment strictly from tasting their gon chow gnau ho alone. It is easy to find this dish even in other parts of the world. It was always my go-to dish when eating in Chinatowns across the US, but again, finding one that is of high quality can often be a challenge. As my favorite Chinese food, my quest for the perfect gon chow ngau ho continues. Cypriot dako is one of the most delicious foods I’ve eaten on my travels. It is somewhat like a pizza made on a bed of crusty rusks, and it is amazing. 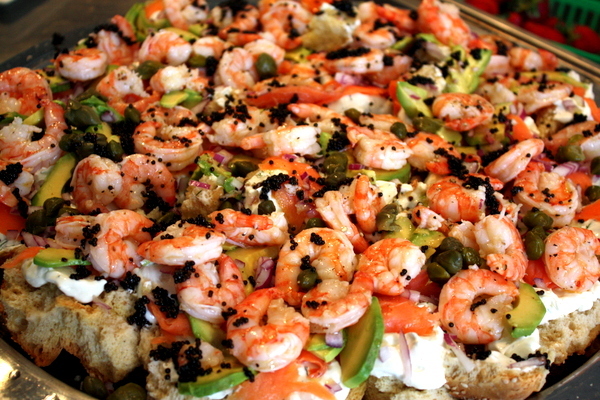 Served as a cocktail item, it is a versatile dish with a base of tomato and feta that can be topped with a variety of seafood, vegetables, and other meats and vegetables. I first learned about dako from Roddy Damalis, celebrity chef and owner of Ta Piatakia restaurant in Limassol. Roddy took me to the municipal fruit and vegetable market in town before giving me a cooking class in a workshop next door to his restaurant. As I sipped Cypriot wine, he showed me how to make traditional dako topped with everything from smoked salmon to prawns, avocado, and onions. If you can’t get to Cyprus, you can try cooking it at home with a recipe from Roddy’s cookbook, My Little Plates. 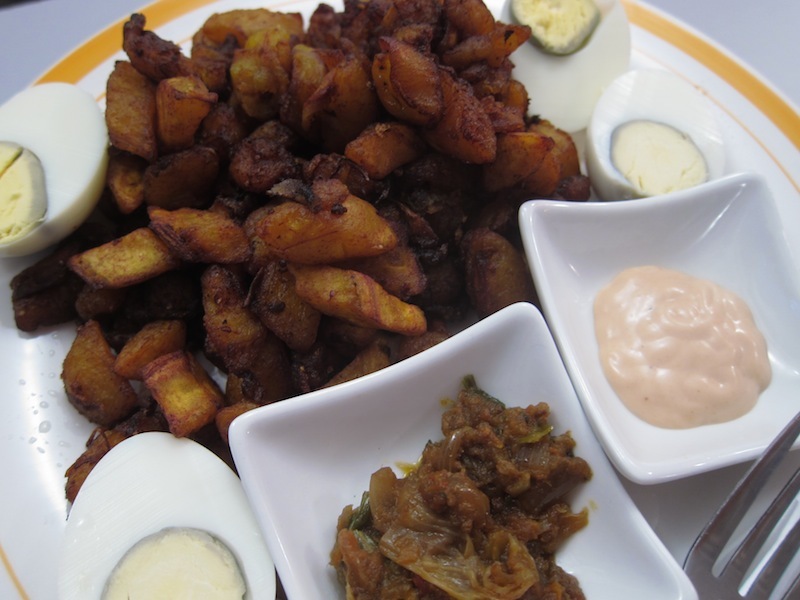 Easy to find and very affordable, Alloco is one of the staples of the Ivorian street food canon. It is a rather uncomplicated dish: fried plantains served with a chili sauce and often a hard boiled egg or two, but the flavor contrast between the sweet plantains and the savory chili goes a long way. Some connoisseurs will toss in some ginger or some chili powder to take the plantains to the next level, but even in its most basic form, Alloco is delicious. A great late afternoon snack to enjoy with a cold soixante-six, the generic name for Cote d’Ivoire’s 66 centileter Bock beer, you can find women frying alloco outside just about any maquis, the catchall term for Cote d’Ivoire’s open air bars. 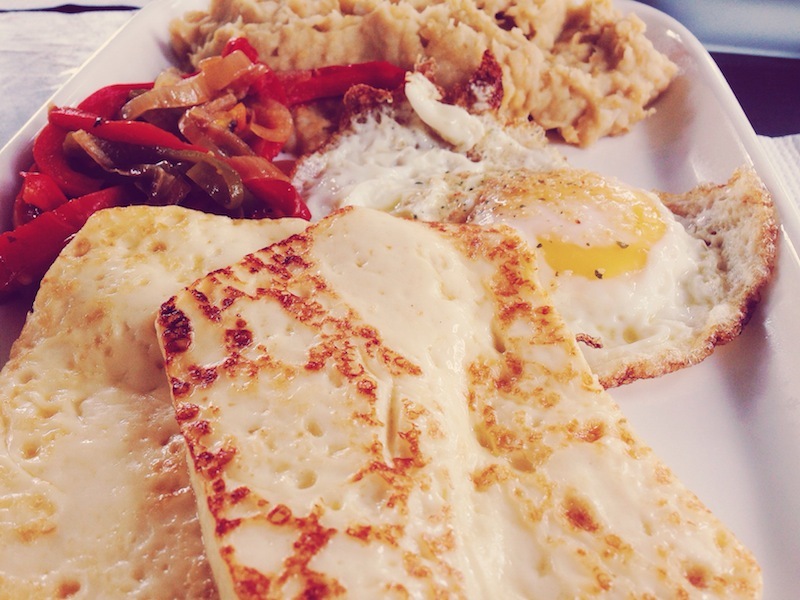 As legend would have it, Mangú got its name from an english speaking tourist exclaiming “Man, Good!” after being served a helping of Mangú; it’s true that, especially if those words were uttered with a mouth still full, it could be interpreted as such. I don’t know that the legend is true, but man, mangú IS good! It’s basically just mashed up plantains, similar to mashed potatoes, but thicker, and stickier, and sweeter, and really very different. The taste and consistency of Mangú varies greatly depending on the ripeness of the plantains (the riper the plantain, the sweeter the Mangú) and the amount and quality of water added during the mashing process. Just like not all mashed potatoes are created equal – like how your grandma had a magic combination of ingredients and routine to make her creamy fluffy mashed potatoes – making a good mangú is quite the art form. The “Tres Golpes” pictured here – fried cheese in the foreground, Mangú in the back – was served to us with love and a side of sautéed veggies at Flor Cafe, between Playa Grande and Abreu, on the North Shore of the Dominican Republic. It’s a magical little spot, and the fact that they make their own cheese definitely helps rank this one of the best Mangús in the country. Likely to have been brought over by the Ottomans during their occupation of Bosnia and Herzegovina, the Cevapi is a simple (and delicious) dish perfect for both lunch and dinner. 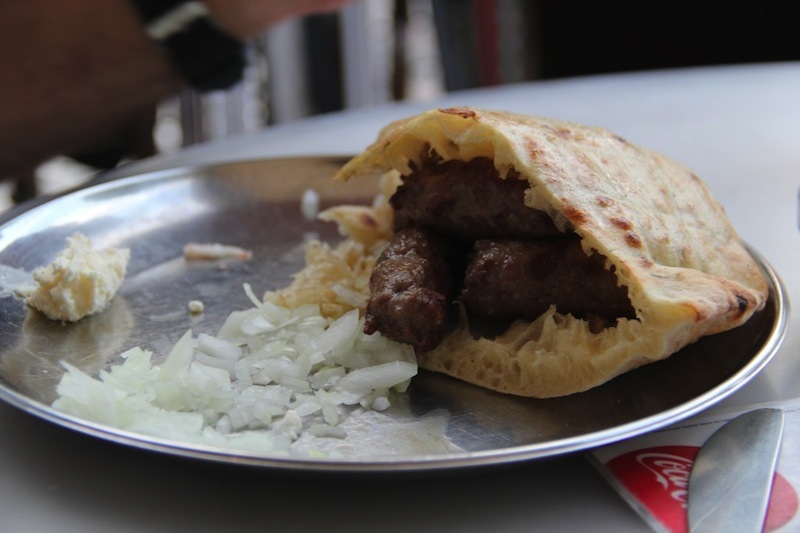 You’ll find that in cities like Sarajevo, Cevapi is served as commonly as a doner sandwich is in Turkey. It’s filling, delicious and will never cost you more than $5. Think of it as a filling and quick fast food! Cevapi is the perfect combination of grilled ground beef placed in a lepinja, a flat and fluffy bread. The meat is shaped like sausage links so it’s hard not to think of it in that light. It is simple yet delicious and usually served with different toppings such as ajvar spread, chopped onions, kaymak and sour cream. The best Cevapi we had while in Sarajevo was in Old Town at a restaurant called Ćevabžinica Željo and trying cevapi while in Bosnia is a must for anyone visiting! While in Jordan, I was fortunate enough to camp out in the Wadi Rum desert with Captains Desert Camp. My fellow travelers and I were treated to a traditional Bedouin barbecue known as zarb – chicken or lamb and herbs and vegetables cooked in a large underground pit. 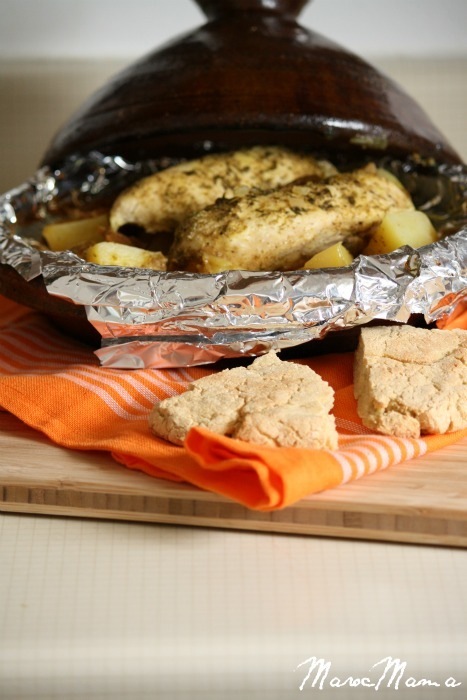 The meal is buried in an “oven” with hot coals and a seemingly endless supply of tinfoil. According to our guides, this tradition is centuries old, and began with tribesmen roaming around the desert looking for water and pasture. Zarb was a means of keeping equipment to a minimum, and back then the food was wrapped in palm leaves. After a night of dancing under the desert stars, we were famished and ready to eat. We all gathered around the pit, and watched several Bedouins pull the massive multi-leveled dish from the warm ground. I remember thinking, how deep is this pit? It felt like the food just kept coming and coming. Our guides then set up a buffet table and spooned the hot lamb and veggies onto our plates. I’m not a big meat lover, but the lamb was tender and soft, falling away from the bone without any resistance. 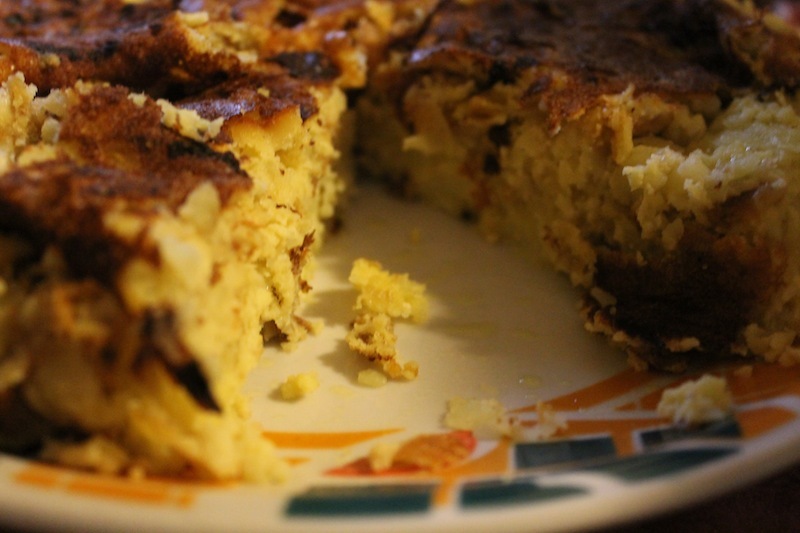 There is no food more quintessentially Spanish than the tortilla española, or Spanish omelet. In a country with a varied gastronomic heritage, the tortilla is the one dish that is eaten virtually anywhere, and it can be found on most menus, from tapas bars to taverns. More popular domestically than even paella, it’s a must if you’re visiting the Iberian peninsula. Tortilla can be eaten with any meal, including atop a piece of bread for a hearty breakfast. Order it by the pincho (peen-cho) and with a healthy dollop of mayonnaise. The omelet is much more than a simple dish: it’s a symbol of the simplicity of Spanish cuisine and one of its most beloved platos. There aren’t many dishes that can be classified as Canadian. 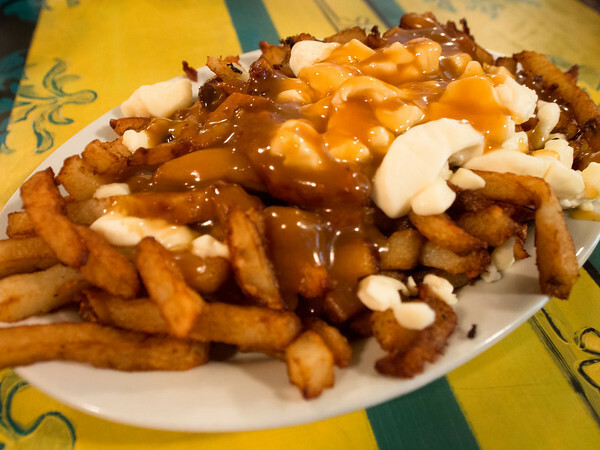 The decadent dish of poutine, french fries with gravy and cheese curds, is French Canadian but can now be found from coast to coast and even if McDonalds – although I wouldn’t recommend eating it there. One of the most famous places to eat it is La Banquise in Montreal, a 24h joint that often has a line-up out the door. It’s definitely good although I’m not sure it’s worth waiting in line. Just make sure whatever you order, it’s real cheese curds as these squeeky dairy treat can make or break a dish. 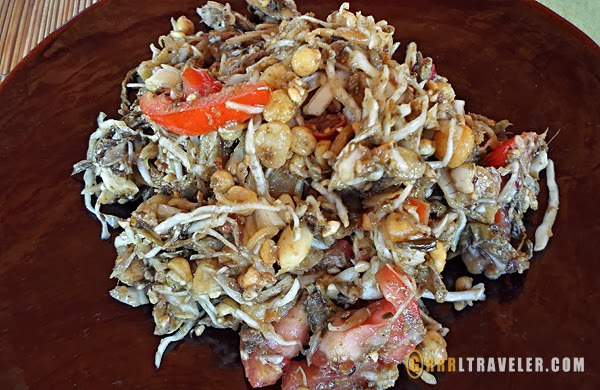 Laab is considered to be the national dish of Laos and it is easily the most popular dish with visitors to Laos. 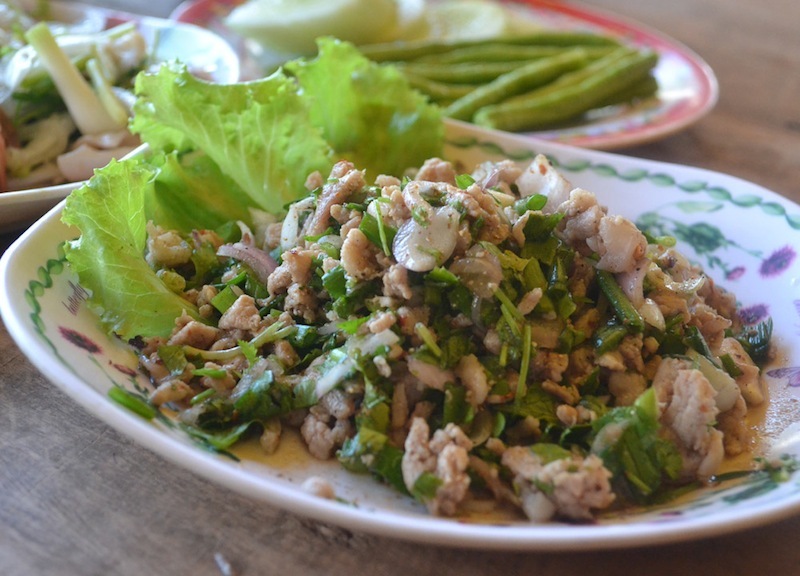 While this fiery minced pork salad is also famous in Thailand’s Isaan region it does in fact originate from Laos and it is a dish they are right to be proud of. Laab Moo is easily one of my favourite foods in Asia and is a must try for any visit to Laos. While Laab does have variations the most popular comes as stir-fried minced pork cooked with shallots, coriander, chillies and mint leaves with added salty of fish sauce and sour of lime as seasoning. Note Laab can also be found with raw uncooked meat but to be safe I advise against eating it; the cooked version is by far the tastier anyway and way more palatable. As with most Lao food Laab should be eaten with sticky rice (Khao Niew) and for that added crunch sides of long bean, cucumber, white cabbage and sweet basil. Another top notch alternative is the chewier Nam Tok (translates as waterfall) Moo which fuses the same ingredients with grilled pieces of pork. For a plate of Laab Moo expect to pay roughly 15,000 Kip upward (US$1.90). 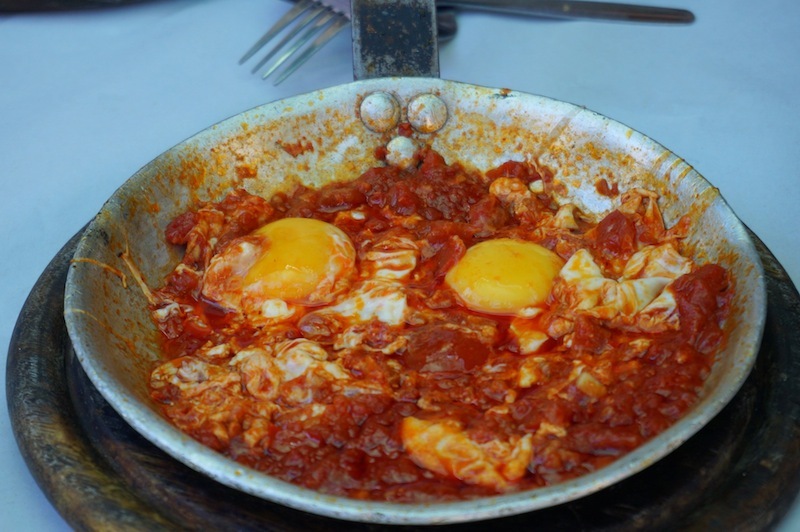 If there is one dish that sticks out in my mind from my time in Israel, it’s shakshouka. Served in the same iron cast saucepan it’s cooked in, you can smell shakshouka long before it even reaches the table. The dish itself is made by preparing a tomato based sauce with lots of onions, peppers, garlic and a myriad of spices. Once the sauce is ready, you crack a few eggs overtop and cover the pan allowing the eggs to cook over easy. You let the whole thing simmer for about 10-15 minutes and then bring it out to the table in the same saucepan you cooked it in. Add a few fresh loaves of bread to sop the sauce, and you have the perfect snack to share with family or a group of friends. While this dish is most commonly served for breakfast, I think it’s a great little meal anytime of day. And it may look messy in the pan, but it’s oh so delicious once you taste it! “Hot pot” is a very popular dish in China. 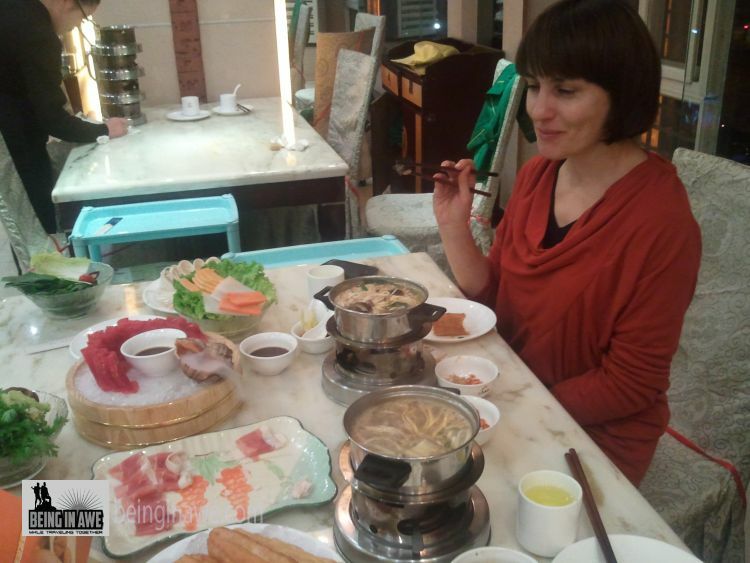 There are many restaurants that specialize only in cooking “hot pot”. Also Chinese people cook “hot pot” at home for family meals. It is usually cooked in one large pan in the center of the table or portioned pans filled with broth for each participant. The broth is heated by gas or electric stove directly on the table. To this you order different ingredients. The waiter gives you a printed sheet with a large list of ingredients (of course in Chinese) and you mark with pen your choice. 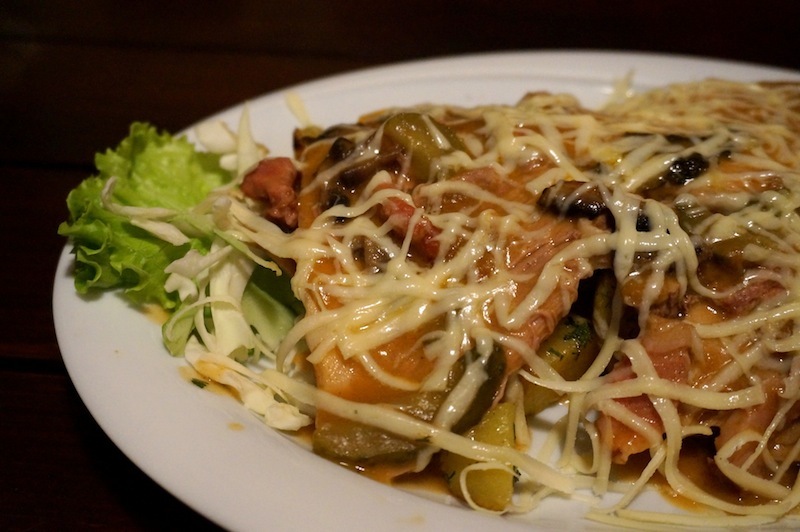 Usually there are fresh thinly sliced pieces of meat of beef, pork or lamb, as well as various kinds of fish and seafood. You can also use different types of mushrooms, vegetables such as corn, potatoes, carrots, tomatoes, and leaves of different greens such as lettuce. And if this is not enough for you, you can throw in fish, various kinds of meat balls and dumplings. Small amounts of ingredients mentioned above are put into the boiling broth, you give the broth to boil again, to cook the ingredients for about 2 minutes and begin to eat just catching pieces from the pan with chopsticks, and then dip them in the sauce. A sauce you can chose or may prepare by yourself in situ by mixing different ingredients such as soy sauce, garlic, red pepper, parsley, etc. After an hour or two, when the amount of broth decreases, the waiter adds more water into the pan. At the end of the meal the broth becomes very nourishing from cooked foods and you can put noodles inside (again, the choice is very large it may be rice or soy noodles, or noodles cooked with vegetables and greens). 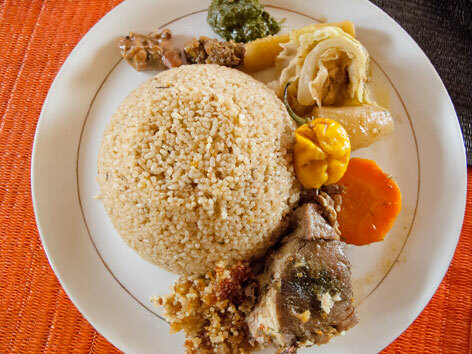 Ceebu jën (pronounced “cheb-o-jen”; also spelled thiéboudienne), the native take on rice (“ceeb” in Wolof) and fish (“jën”), is definitely the dish most associated with and beloved by Senegal—indeed, many people eat it for lunch several times a week. Its components are many: seasoned rice; a piece of grilled or pan-fried fish, stuffed with a garlicky paste (called the rof); a few large pieces of vegetables—carrot, cabbage, cassava, turnips, etc. Then there are the accoutrements: dahkar (mouth-puckering sweet-sour tamarind), xooñ (the crispy burnt rice scraped from the pan’s bottom, as valued as paella’s socarrat in Spain), and bissap, a slimy, sour green sauce made from hibiscus leaves. It’s not hard to love this dish—the flavors are fresh and bold, with hits of tart balanced against sea-salty savoriness; the textures are beautifully varied. It’s cheap, delicious, and filling midday grub, easy to find at most restaurants in Dakar and elsewhere—but if you’re invited to eat it in someone’s home, you’d better say yes. Thinking of Croatia and food the minds goes straight to fish and seafood, courtesy of the country’s over 1000 miles of coastline. However my dish of choice here is of a completely different source. Bridging between central Europe and the Balkan peninsula, the Croatians have refined a peculiar skill in cooking meat, especially lamb, that here seems to taste better than anywhere else. 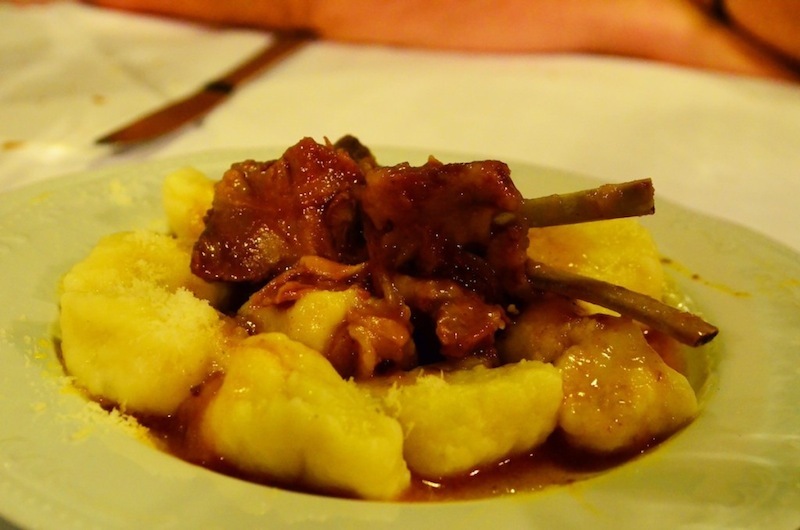 My favourite feature of Croatian cuisine is the roasted lamb with gnocchi, a very simple dish made incredibly delicious by the quality and freshness of the few ingredients. The first time I tried it was in Cres: the lamb is roasted in a stone oven, fuelled with olive branches, while other lamb is grilling on a barbecue, the two smells inebriating the evening air, already dense with heady flavours of Mediterranean herbs and heath. The meat, once roasted to perfection, is served in its own sauce, thick and tasty, in a dish with few fist size gnocchi, made with potato mash and flour. The flavour of the lamb marries perfectly with the mild texture of the gnocchi, perfect also for dipping in the sauce. It’s best enjoyed with a glass of red wine, or even with a fresh beer, both excellent and locally produced. 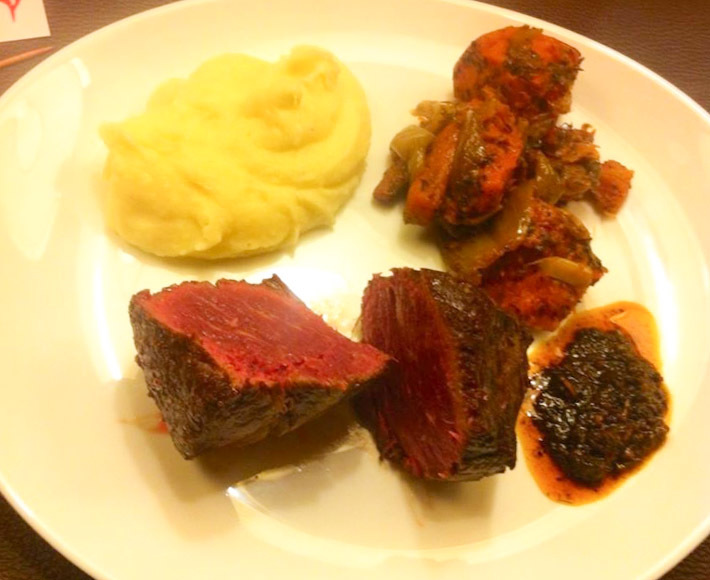 When I was asked to write about a food that sums up Argentina I only had one thought; beef. Argentinian beef is world-renowned, and probably the best steaks you can buy. This is because their cows are free to roam, getting exercise, eating the wonderful pampas grass and bask all day in the rays of the sun. The finest example I can give of an Argentinian steak was from The Argentine Experience; a cooking class / dining experience we visited in upscale Palermo, Buenos Aires. The Argentinian Experience method of cooking is also very unique. The asado is not the same as a barbecue, the emphasis is put on slightly smoking the meat and cooks in a much slower time. This makes the steak melt in the mouth, so tender you could cut it with a spoon. The only problem is that us westerners love our seasoning, and Argentina is no different to the rest of South America where the food lacks salt and pepper. But the steak we had, served with another Argentinian staple; chimichurri sauce, and partnered with a Malbec from Mendoza will definitely rock your world. Guaranteed. Now that I am living in Mexico, I am constantly overwhelmed by sheer volume of all the incredible food here. 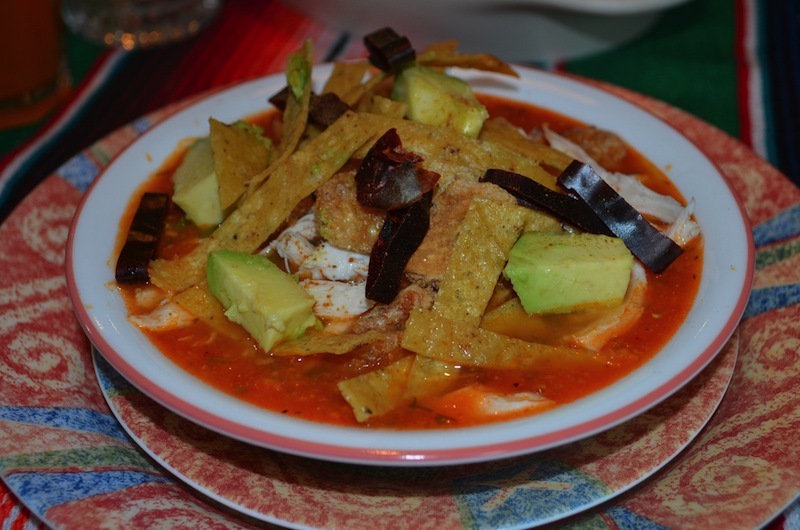 But there is one Mexican dish that had my heart from the very first bite – that dish is tortilla soup, or in Spanish, sopa de tortilla. The origins of this soup are uncertain, but its deliciousness is a certifiable fact. The soup-y aspect of the soup is very simple – it is a rich tomato soup that carries the smoky flavours of chipotle en adobo (for the uninitiated, chipotle en adobo is a kind of stewed smoky chili that tastes really bloody good). I am accustomed to eating tomato soup at home, but the addition of chipotle en adobo creates soup-y yumminess of a whole different kind. But wait for it –this soup only gets betters. As well as this amazingly rich broth, there is also a whole load of “stuff” floating around in the soup, but instead of being added to the soup while cooking, it is added to bowl when serving. In your empty soup bowl you will place handfuls of diced avocado, queso fresco, lumps of tomato, and finely chopped onion. The hot, steaming soup is poured on top, and the soup is garnished with freshly fried strips of tortilla, plenty of fresh coriander, fried pieces of ancho chili, and a dollop of cream. The feeling of the putting a hot spoonful of tomato-chili soup into your mouth and then biting through cold avocado, cheese, and crunchy tortilla strips is an unparalleled sensation, and I simply cannot get enough. Ask anyone in the Republic of Georgia what their favourite local dish is, and you will inevitably hear the word khachapuri (pronounced hachapoo’ree) several times. A cheese filled flat bread, some may say it is the Georgian answer to pizza, others may call it Georgian cheese bread. It is normally the first dish Georgians will offer you, and each region has its own variation. The most common is khachapuri Imeruli, from the Imereti region, which looks like a pizza with no topping. My favourite one is the Adjarian khachapuri, prepared in an open boat shape and topped with a soft-boiled egg and some butter. Foreigners make the mistake of using cutlery to eat it, but you should only use your hands: first break the tips of the bread, using them to mix the egg, the salty cheese and the butter, then dip the bread in the juicy mixture before eating it. 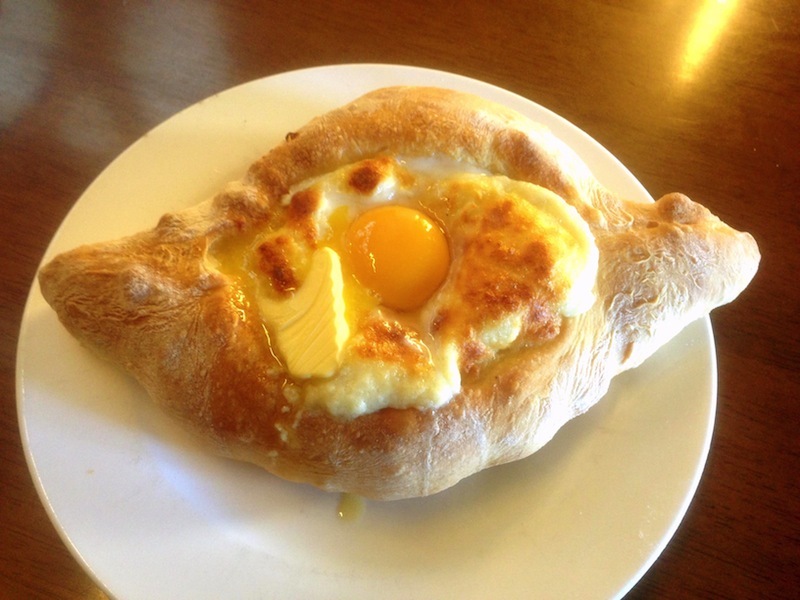 Khachapuri is normally served without salad or side dish. On my last trip to Georgia, my diet was almost entirely based on khachapuri. This not only made my taste buds dance with joy, but also kept my pocket healthily full – it is one of the cheapest dishes served in restaurants around the country, and the regional varieties will make you travel around the country without moving from your table. 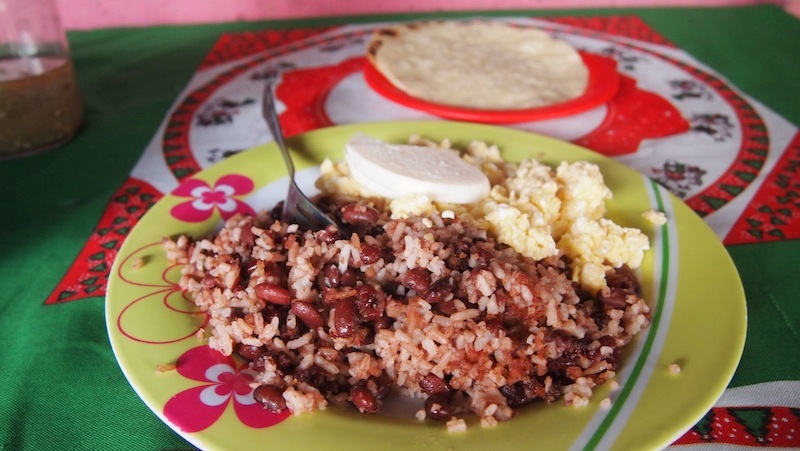 This is the typical breakfast meal found all over Nicaragua, consisting of gallo pinto (rice and beans), scrambled eggs, a slice of cheese, fried plantain and fresh tortillas. Optionally it is served with natilla, a very thick sour-cream like condiment. To drink, it’s typically instant coffee. Typical cost of breakfast from simple food places is around 35-40 Cordobas ($1.50). I like Central Asia cuisine because is a mix between Russian, Chinese and Muslim influences. I choose Lagman (most places have no English menu, so look for Λaгmaн I in Cyrillic alphabet). It’s basically a noodle soup but strong body but you don’t need to be a master with the chopsticks as lagman will be eaten with fork and spoon. First you will drink the soup while it is hot to warm you (Kazakhstan can be quite a cold country outside summer time) and then eat the rest of the topping with the fork (as a stir fry style). Most of the noodles are homemade if you are lucky to eat at some locals home. The rest is usually picked vegetables or peppers, carrots, onions and tons of rosemary (Kazakhs, as Russian, love rosemary). 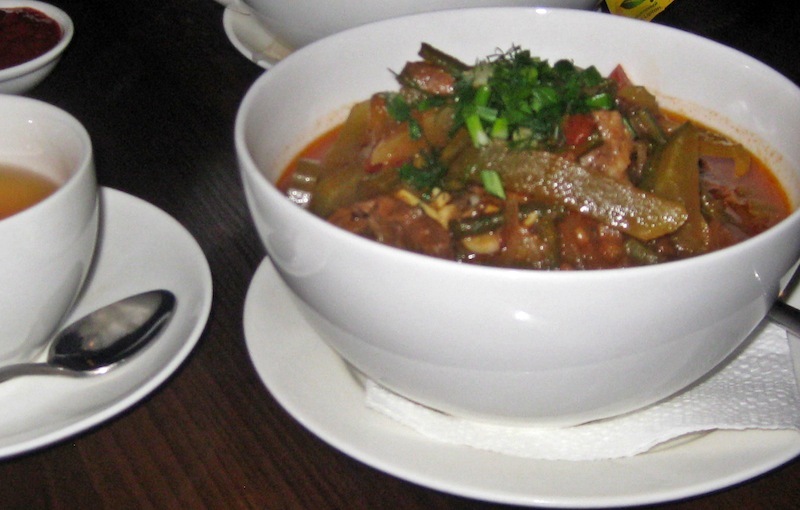 In a restaurant, an acceptable size bowl of lagman will cost you approximately 400Tг (Kazakh tenges, 2.5US$). Kazakhs enjoy eating their food with hot drinks and teas as the Chinese do. Injera fir-fir is a staple in Ethiopian cuisine. Injera is the bread that accompanies almost every Ethiopian meal and dish. Its taste is notably sour and the sponge-like texture set it apart from other Ethiopian bread and breads from other places. Fir-fir is made of butter and a mixture of spices called berbere. Onions, other vegetables, chilli peppers, and meat can also be added depending on the chef. Injera fir-fir is usually served differently than what you see above. 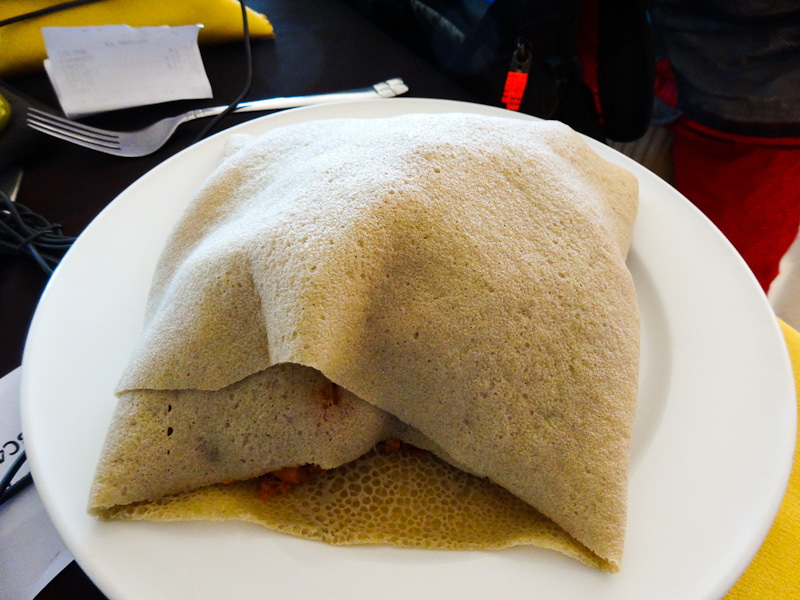 Normally the injera serves as the bottom of a large pan and the fir-fir is added on top. The injera is the ripped with the right hand and used to scoop up whatever the chef added to the fir-fir mix. Mine was served self-contained since I was dining alone. But injera fir-fir is a very social dish meant to be shared. 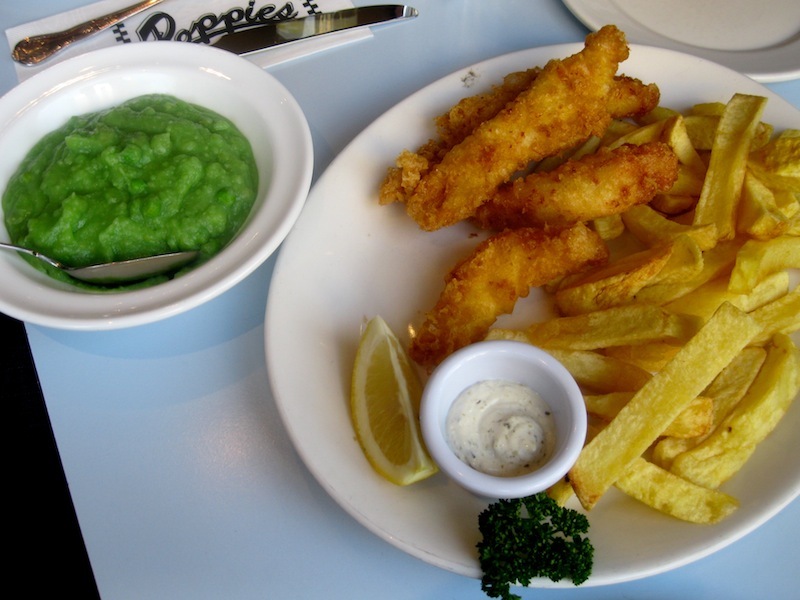 Ask someone what food they think of when they think of the UK and it’s almost invariably fish and chips. Not being a huge fan of fish myself, I’ve never really got into this signature dish of my home country. That was until I tasted what Poppies, one of the oldest fish and chip shops in Shoreditch in London’s East End, served up. Unusually, at Poppies they deep fry the fish in peanut oil, giving the batter a crisp texture without being too greasy. The chips, made from locally grown, organic potatoes are also perfectly cooked and the traditional side dish of mushy peas (mashed green peas, butter and mint), while it sounds odd, is actually a really nice accompaniment for its contrasting creamy flavour and smooth texture. As British as this dish my seem, its origins are actually from further afield: it’s believed the idea of battering and deep-frying fish was brought to the UK by Jewish immigrants from Portugal and Spain in the 17th century and wasn’t first sold together with chips (themselves brought to the East End by Irish immigrants) until the late 19th century. 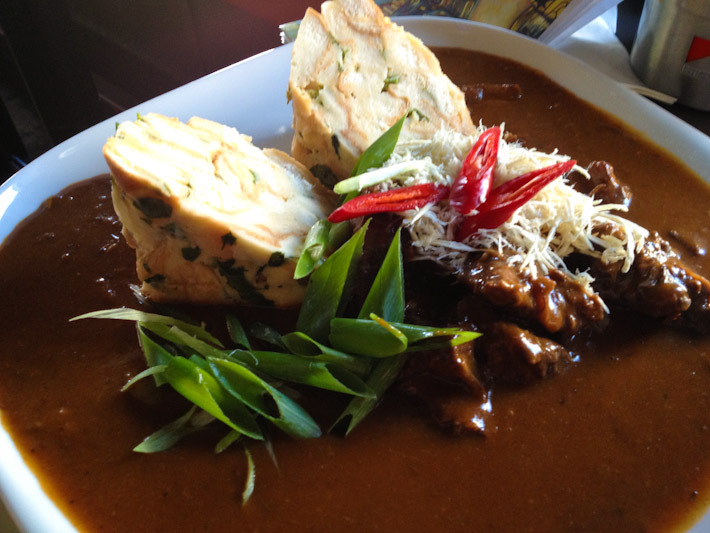 Also popular in Hungary, beef Goulash is one of the most typical dishes you can find in Czech Republic. The weather makes has made this region dependent on meat and carbs during the harsh winters, no wonder the most traditional dishes consists in some sort of meat stew with a side of potatoes or dumplings and, to represent the vegetable side of things, mostly sauerkraut (fermented preserved cabbage). Beef Goulash in the Czech Republic is seasoned with sweet paprika: the meat is slow cooked until deliciously tender and the flavor of the sauce is absorbed by every inch of beef. It is usually served with dumplings made out of bread and milk (houskové knedlíky) and, because this is the Czech Republic, very often washed down with local beer (sometimes also part of the meat marinade!). You’ll be able to find beef Gouslash pretty much anywhere in the Czech Republic, even pubs. If it’s summer, you’ll might end up sleeping dinner if you have one of this servings for lunch.. but if it’s winter, you’re going to be grateful to allowed our body all this comfort! Myanmar has a handful of interesting salads that will prove quite refreshing for a hot Burmese day. Pickled Tea Salad or Laphet Thote is a traditional delicacy in Burma and one of my favorite food discoveries. I first tried it at a restaurant on Inle Lake and once it did, I sought it out. Tea leaves are symbolic of peace, given between two conflicting parties and this is often served at weddings and ceremonies. It’s made from actual fermented tea leaves and mixed with fried beans, peas, tomatoes, garlic, chili and cabbage. There’s no way to describe this complex flavor other than nutty, citrusy and crunchy. it comes in ranges of mild to spicy and mine was quite mild. You can eat it with rice or alone. I chose this dish because the first time I came to Morocco I must have eaten a variation of this dish almost every day. Tajines are probably the single most famous and important cooking vessel and way of serving food in Morocco. The word tajine refers to the conical cooking vessel and it also refers to the meal cooked inside. Tajines are never served with couscous – they are two different dishes. The meal is a combination of meat (or sometimes vegetarian), fresh seasonal vegetables and a mixture of spices. The resulting dish is a slow cooked masterpiece. The best tajines are slow cooked over charcoal but many modern day cooks use a pressure cooker to speed up the process. If you’re visiting Morocco make sure to try at least one charcoal cooked tajine, you’ll taste the difference! The humble baleada is well-known all over mainland Honduras and the Bay Islands chain on the country’s Caribbean coast. It is cheap, simple and made from easy to find ingredients. You can find people from all over enjoying a baleada, no matter their age or social status. To make a baleada, a tortilla is freshly prepared and put on a grill to cook. Once it is cooked and pliable with a couple yummy charred spots, refried beans are slathered on and topped with your choice of items: a baleada sencilla (simple) is just refried beans, mantequilla (runny sour cream) and queso (a hard cheese similar to feta), or you can add shredded chicken/beef, scrambled eggs, avocado, pickled onions, spicy peppers or even grilled hot dogs! The tortilla is then folded closed in half like a quesadilla and eaten. 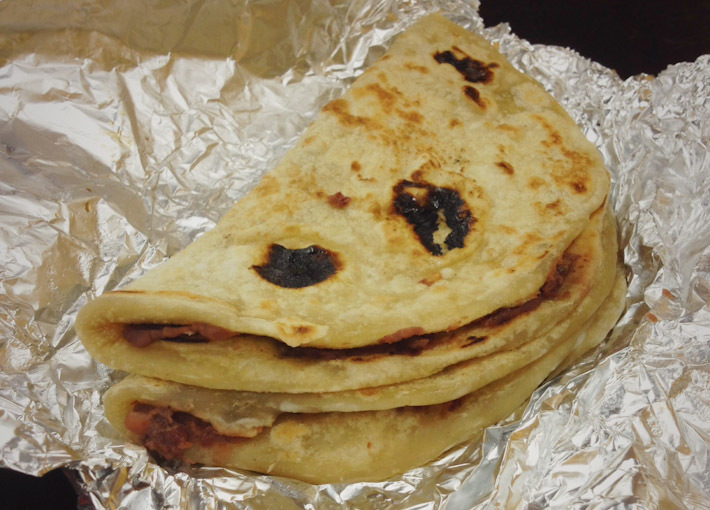 It’s a quick breakfast or snack, and if you put enough fillings in it can be lunch or dinner, or even a good post-bar meal on the way home – baleada stands are often found along main streets at night. It doesn’t look like much but is hot, easy to carry on-the-go and hits the spot. On the mainland of Honduras you can find baleadas for anywhere from L.5 (about $0.25) to L.60 (about $3.00) depending on your choice of fillings. In the Bay Islands everything is a little more expensive so expect to pay about L.10-L.80 ($0.50-$4.00)… still easy on the wallet for travelers! It is no problem to get yourself a vegetarian version (just don’t add meat) or gluten-free (ask for tortilla de maiz to get a corn tortilla instead of wheat) for travelers with special dietary needs, and because they are so simple they are good for kids as well. If there is one thing that Fiji is famous for, it is kava. Kava is produced from the roots of the plant of the same name. Kava can be produced from either a fresh or dried plant, but most of the time you will see it in dried form. It is then mixed with water, creating a murky, gritty brown drink. Appetizing right? The drink is famous for its effect as a sedative and anesthetic. After a couple of sips you will start to feel your lips and mouth go numb, however the drink is not intoxicating. 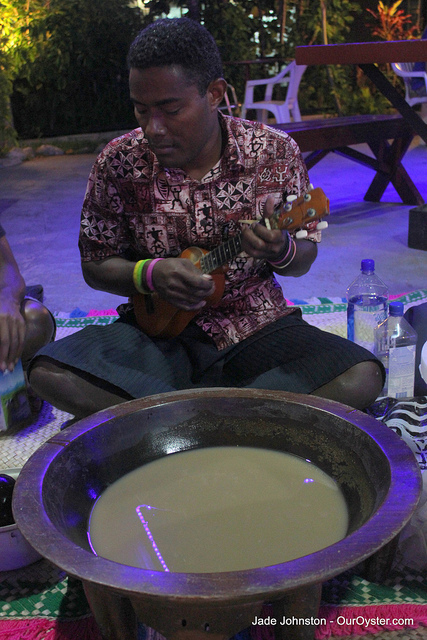 It is fairly easy for travelers to Fiji to experience kava. Most guesthouses and hotels have one or two “kava nights” where you can learn about the drink, experience a kava ceremony, and of course, partake. What does your side of the world taste like? Tell us about the typical dish of your country! 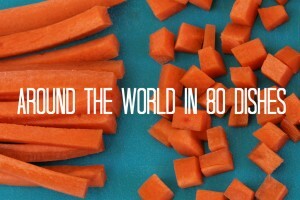 Read Around the World in 80 Dishes, part 2/2 here! Thanks for including our piece here – such a wide range of foods…all very tasty looking! Thanks for your participation, Sam! We only tried mushy peas once in a college cafeteria in Wales.. it wasn’t very good to be honest, but I guess the fact that it was a cheap meal done for the masses of students didn’t help. Gotta go back one of these days and try some proper mushy peas. The ones in the photo here sure look much better than the ones we had! GHAPAMA is my favourite! would love to try it one day! It does look very interesting indeed. Would love to try it myself too! Thanks for including me in this round-up. What a great lot of mouthwatering foods!! Woah! This post should come with a disclaimer: don’t read on an empty stomach! Thanks for asking us to contribute and I’ve certainly learned about many new dishes from around the world. Yeah, that disclaimer is more than appropriate! Amazing post! We’re definitely hungry now, and in the mood to taste something new! Lots of great discoveries from this post :) Thanks so much for including us in this epic roundup! So glad to be a part of this crazy delicious post! Love reading all the other food from all around the world. A lot of love (and a grumbling stomach)! Great post! Thanks for including me in the round-up! Thanks for including me, although I should not have read this right before dinner! Well….I’m ready for my lunch break now! It’s a crime that there’s no mention of Lebanese food! Terrible terrible terrible. 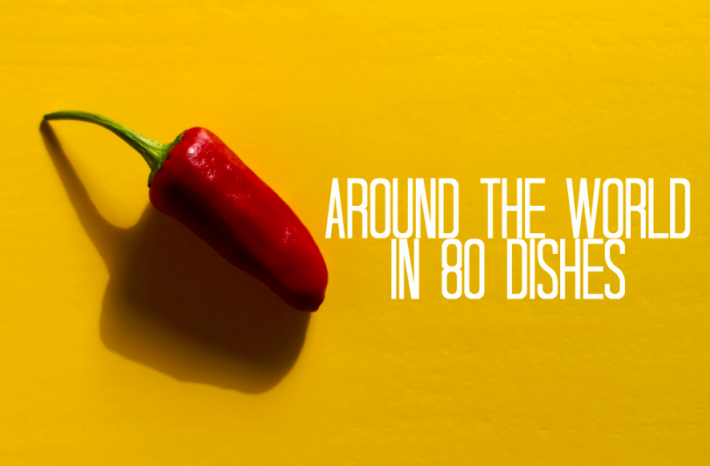 It’s “around the world in 80 dishes”, and as there are more than 80 countries in the world, many are unfortunately left out! That’s not to say that Lebanese food didn’t deserve a spot here. It’s a cuisine that I love and indulged in a lot while living in Dubai! I’m right now in Indonesia digging into a SOTO, what a coincidence guys! 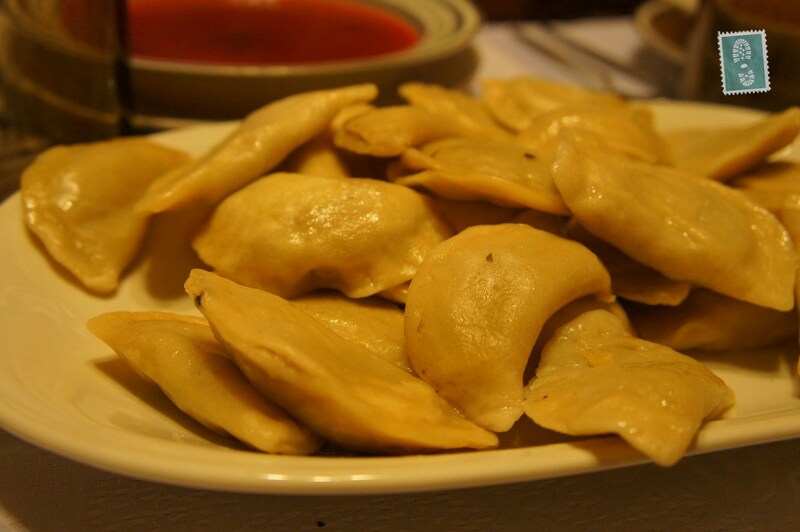 Great post, but right now I’m missing some Polish pierogi so badly! Thanks for having me here! Great post, brilliant idea, the food all looks so good. Fantastic job bringing all of this food to us. What a delicious post, A&Z! I’m now looking forward to Part 2. Thanks for inviting me! Part 2 is going live tomorrow. Amazing guys! So much to learn (and dream about) in this post. I’m so hungry now! What a amazing selection of delicacies from around the world! Can’t wait for Part 2! Part 2 coming up later today!! Thanks for asking us to be a part of this. This is an amazing list and so interesting to read about some foods I’ve never even heard about! I never heard about many of the above myself either. 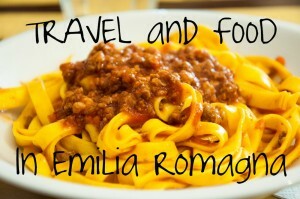 More reasons to keep on traveling, exploring AND eating! Would love to travel to Azerbaijan one day! The Ghapama from Armenia! I’m so glad the writer linked the song to it, it’s one of my favorite Armenian dance songs and weddings and parties and one of my favorite dishes. All of the dishes here look amazing, but I think I’m going to have to go to Little Ethiopia for dinner some time this week! Can’t wait to see the second instalment – hoping you’ll include Singapore?! Pingback: Caribbean Eats! Mangu (Plantain Mash) – Dominican Republic | Caribbean Eats! Such a fantastic list. I wish I hadn’t read it before lunch! This post made me drool. Especially the Asian dishes (Thailand and Taiwan) are flavors I love very much. 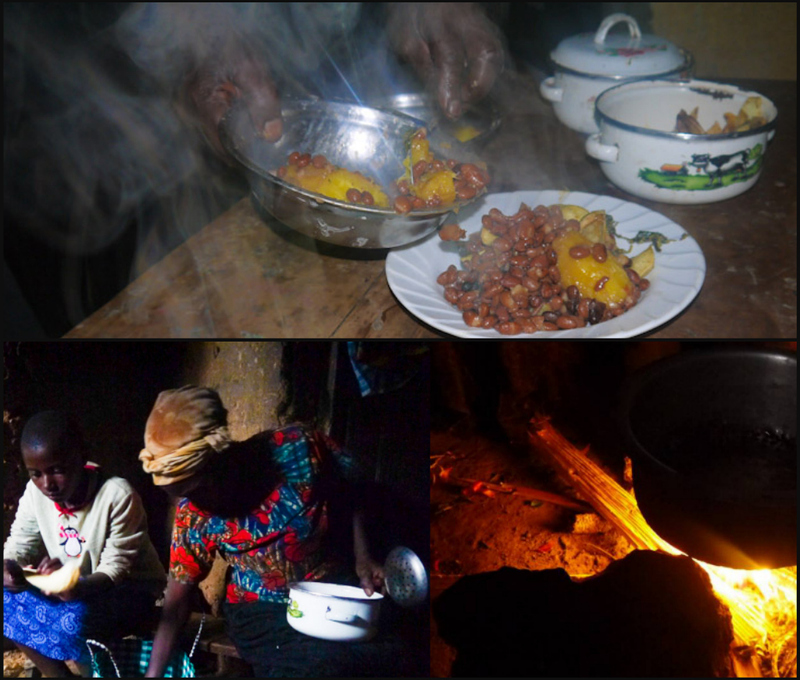 It is awesome that you listed so many African countries dishes, even though I didn’t really enjoy the foods I tried in Africa, I think every traveler should try the signature foods in every country they visit.